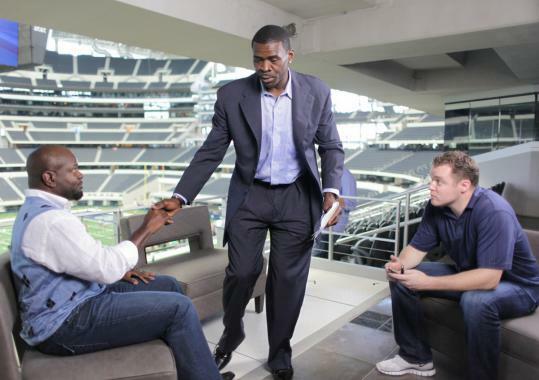 Jason Hehir (right) with Emmitt Smith (left) and Michael Irvin on an NFL Network set. Writing for the student newspaper as a sixth-grader at the Horace Mann School in Newton, Jason Hehir telephoned WBZ-TV sports anchor Bob Lobel for an interview. “I went over to the studio, spoke with Bob for a half-hour, and got my story,’’ Hehir said of his journalistic triumph. It was the first of many for Hehir, now 34, who went on to graduate from Newton North High and Williams College. Hehir formed his own production company, JMH Films, based in Los Angeles, and is a five-time Emmy Award-winning producer and director. His latest endeavor was as director of an ESPN Films documentary, “The Fab Five,’’ which chronicles the 1991 recruitment of basketball stars Juwon Howard, Jimmy King, Jalen Rose, Ray Jackson, and Chris Webber by the University of Michigan men’s basketball program. First aired the night that the NCAA announced its basketball tournament field in March, it is the highest-rated documentary ever produced by ESPN. Hehir, who was a ball boy for the Boston College basketball team, and played varsity baseball at Newton North and at Williams, said the original premise of the documentary was to have the players reminisce while sitting around a table. Webber, a five-time NBA All-Star who called the infamous “timeout’’ in the 1993 NCAA championship game against North Carolina, chose not to be interviewed. “It turned out to be a much better overall film because we were able to spend the money on interviews with Michigan’s president and athletic director, other teammates, and head coach Steve Fisher, ’’ said Hehir. “One door closed and another 12 opened. After college, Hehir spent three years at NBC Sports and seven years at HBO Sports, both in New York City. Williams College graduate Sam Flood, now executive producer at NBC Sports, gave Hehir his start. “It didn’t take long for us to see that our instincts were right,’’ said Dahl. “Jason brought a strong knowledge not only of that Michigan team and college basketball of the ’90s, but also of the cultural and musical forces that made ‘The Fab Five’ so special. “We sat together in the dugout at Shea Stadium where Mookie’s ground ball went through Bill Buckner’s legs and it was fascinating . . . just surreal,’’ recalled Hehir. Hehir’s love of sports and his curiosity paid dividends when he was 8. Bridgewater State University women’s lacrosse teammates Bethany Bush of Littleton and Katie Weber of Arlington were named Defensive Player of the Year and Goalkeeper of the Year, respectively, by the New England Women’s Lacrosse Alliance. They were joined on the first team by two fellow seniors, cocaptains Jenny Jones of Framingham and Courtney Lennon of Medfield. All helped the Bears set a program record with 17 victories and win the NEWLA regular season and tournament titles. Bush had 52 ground balls and 30 caused turnovers to go along with three goals and three assists, while Weber set the school’s single-season goaltending record with 17 wins and an .895 winning percentage. She graduated as the program’s career leader in winning percentage (.852). Jones, who played the attack position, led the conference in scoring with 73 goals and 26 assists, and is the program’s career leader in goals with 290, while Lennon, a midfielder, this spring had 52 goals, 31 assists, 83 points, and 19 caused turnovers — all career highs. Natick’s Anjali Forber-Pratt set a world record at a paracycling meet near in Switzerland on Sunday, clocking 29.61 seconds in the 200-meter event. She also placed second in the 100 and third in the 400. She will compete today in the Daniela Jutzeweler Memorial in Muttenz. . . St. Michael’s College junior defender Evan White of Sudbury was named to the New England Intercollegiate Lacrosse Association’s Division 2 All-New England first team. He led the Purple Knights with 56 ground balls and 15 caused turnovers. . . Patrick Leahy, who coached the boys’ varsity at King Philip Regional High last season, has been named head men’s hockey coach at Stonehill College. Marvin Pave can be reached at marvin.pave@rcn.com or 508-820-4223.